More day elapsed more people braced Islam. In Mecca the heads of Quraish tribe were losing the grip on the situation. After a consultation meeting they decided to select one worrier from each tribe and invade Prophet Mohammad’s house at night and kill him, thus not one but all tribes would be responsible for his murder. In that case his tribe, Bani Hashem, could not confront with all the tribes to take revenge. At the night of attack Prophet Mohammad (S.A.W.) came to know of the conspiracy by Angel Gabriel. Therefore he decided to leave Mecca for Medina. He left the house in dark but before that he asked his cousin, Ali Ebn Abi Talib (A.S.), to sleep in bed instead to mislead the terrorists about his presence. The advantage of this action was the invaders would only concentrate on the Prophet Mohammad’s house and he could easily move from one point to another without being chased. At the break of dawn the group invaded Prophet Mohammad’s house with high hope of finishing him and his new religion soon. But when Ali was found instead of him they realized the plan fell through. Having high number of new Muslim supporters in north, Quraish concluded Mohammad could be on his way to Medina. Also knowing that he could not be far away from Mecca they started a search and hunt operation immediately. For that professional trackers were hired. Also a bounty of hundred camels was offered for information which could lead them to Mohammad’s hideout. Some people from Quraish took the matter in their own hands and started searching, mostly the north part of Mecca toward Medina without knowing that Mohammad had gone due south, hided in a cave called Thour. But one renowned tracker from Mecca who knew Mohammad’s footprint came very close to the cave. 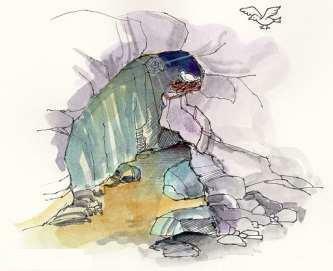 He supposed he might be hiding inside the cave, thus assigned someone to search inside. When the guy stood in front of the cave he saw birds have laid eggs and thick spider web has covered the entrance. Thus without going inside he returned saying that an intact spider web on the entrance indicates no one has entered the cave recently. After four days hiding in the cave Prophet Mohammad (S.A.W.) and his companions started his 400 kilometer journey to Medina. Due to the extreme desert heat it was decided to sleep by day and move during night. One day, while taking rest, their location was spotted by a bounty hunter. Confident of capturing or killing Mohammad he came close riding by on his horse. Prophet Mohammad (S.A.W.) prayed “Dear Lord! Save us from this man.” In short time his horse was startled and fell him down badly. The bounty hunter realized of the heavenly-sent of the incident thus showed repentance to Prophet Mohammad (S.A.W.) for his action.